At only 18 months old, Charlie has learned that a boy’s best friend is a cool set of wheels. Charlie was born with a heart defect that required him to be in the hospital for the first eight months of his life. His condition requires a ventilator, tracheostomy and around-the-clock nursing care. At first, he was unable to sit up and had a hard time moving his legs and arms. When he was discharged from the hospital, Charlie’s parents, Autum and Brad, brought him to ChildServe’s Inpatient Pediatric Rehabilitation Unit. 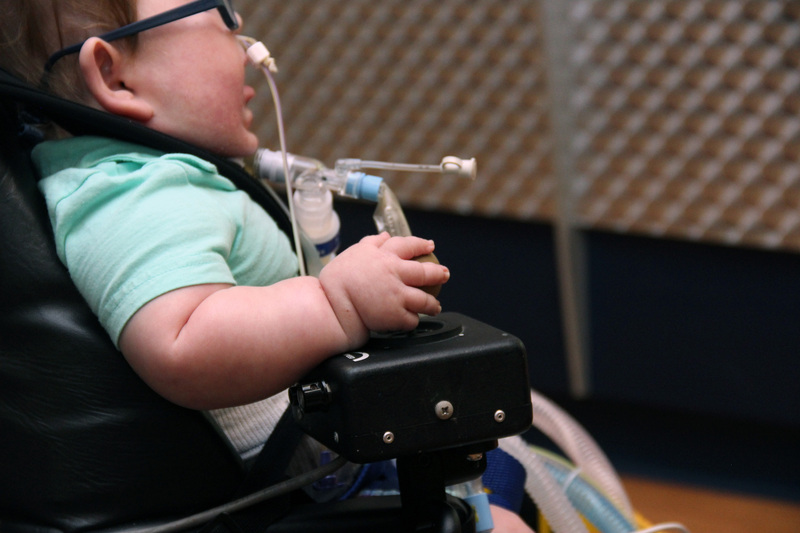 Charlie has loved getting out and about during his physical, occupational and speech therapy sessions, because he likes learning to move independently. For such an active boy, lying down and being pushed in a stroller or chair isn’t enough. Eric Enderton, ChildServe’s Adaptive Equipment specialist, decided to find a way to help Charlie get around on his own. He designed an adaptive power chair that’s completely custom-made to fit Charlie’s medical needs and bright personality. The chair, which more closely resembles a bumper car, is decked out with painted-on flames and the ChildServe logo. It has a joystick that Charlie can grasp and control on his own – something he learned to do in just one day. Eric said he could tell Charlie was a special little boy, which is why he decided to go above and beyond when designing his chair. The chair was a complete surprise to Charlie and his mom, Autum, who were expecting the basics – just something to help Charlie get around. When Eric brought the chair in for the first time, Autum, Charlie’s mom, was speechless. The flashy power chair has made Charlie popular with all of ChildServe’s nurses and therapists, who love to see him buzzing down the hallway. He learned how to operate it quickly, but sometimes gets distracted and stops to give a big, tongue-out smile to whomever he sees. After leaving ChildServe’s Inpatient Pediatric Rehabilitation Unit, Charlie will head home with his parents, big sister, and homecare nurses to help with his ventilator and tracheostomy. He will continue at ChildServe with outpatient speech, physical and occupational therapies. Ride on, Charlie!